Beer is an alcoholic drink brewed frae maut, hops an baurley. Beer is the warld's auldest an maist widely consumed alcoholic drink; it is the third maist popular drink oweraw, efter watter an tea. The production o beer, brewin involves the baurmin o siccars, mainly derived frae cereal grain stairches—maist commonly frae mautit baurley, awtho wheat, maize, an rice are widely uised. Most beer is flavoured wi hops, that add bitterness an act as a naitural preservative, tho ither flavourins sic as yerbs or fruit mey occasionally be includit. The baurmin process causes a naitural carbonation effect, awtho this is eften remuived during processin, an replaced wi forced carbonation. 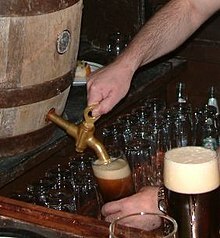 Some o humanity's earliest kent writins refer tae the production an distribution o beer: the Code o Hammurabi includit laws regulatin beer an beer parlours, an "The Hime tae Ninkasi", a prayer tae the Mesopotamian goddess o beer, served as baith a prayer an as a method o rememberin the recipe for beer in a cultur wi few leeterate fowk. Beer is sauld in bottles an cans; it mey an aa be available on draucht, pairteecularly in pubs an baurs. The brewin industrie is a global business, conseestin o several dominant multinaitional companies an mony thoosands o smawer producers rangin frae brewpubs tae regional breweries. The strenth o beer is uisually aroond 4% tae 6% alcohol bi vollum (abv), awtho it mey vary atween 0.5% an 20%, wi some breweries creautin ensaumples o 40% abv an abuin. Beer forms pairt o the cultur o beer-drinkin naitions an is associatit wi social tradeetions sic as beer festivals, as well as a rich pub cultur involvin activities lik pub crawlin, an pub gemmes sic as bar billiards. In Canadae, the Canadian Govrenment’s Fuid an Drog Regulations states that beer shoud hae alcohol content that ranges frae 1.1% tae 8.6%. The regulation an aa includes that it coud be greater nor 8.6% an labeled accordinly. Beer in Sooth Korea shoud hae 25% (v/v) or less. That means that it haes tae be 25 mL o alcohol or less per 100 mL o solution an can anerly be conseedert ‘lite’ if thay hae less nor 30 kcal per 100ml. Mair specifically, major ingredients sic as Maut (baurley an wheat), Hop, Watter, Stairch ingredients hae tae be allaed bi the Sooth Korean Regulations in the brewin process. Beers an ither seemilar variations in Singapore maun hae at meenimum o 1.0% alcohol (v/v) concentration at 20°C. It is eften brewed frae a mixtur o grains lik maut, succars or it's equivalent an hops or ither vegetables. ↑ World's Best Beers: One Thousand ... - Google Books. books.google.com. 2009-10-06. ISBN 9781402766947. Retrieved 2010-08-07. ↑ Max Nelson (2005). The Barbarian's Beverage: A History of Beer in Ancient Europe. Routledge. p. 1. ISBN 0-415-31121-7. ↑ Barth, Roger. The Chemistry of Beer: The Science in the Suds, Wiley 2013: ISBN 978-1-118-67497-0. ↑ "How Beer Is Carbonated and Why Is Beer Fizzy?". Retrieved 31 December 2016. ↑ "World's strongest beer reclaimed". BBC News. 2010-02-16. Retrieved 2015-08-05. ↑ Branch, Legislative Services. "Consolidated federal laws of canada, Food and Drug Regulations". laws.justice.gc.ca (in Inglis). Retrieved 2017-07-18. ↑ "Global Agriculture Information Network" (PDF). ↑ "Food Regulations in Singapore". Wikimedia Commons haes media relatit tae Beer. This page wis last eeditit on 27 Julie 2017, at 02:36.